Rather than the same old|! !| same old tossed green salad|! !| I suggest this one of pears (you can substitute apples if you wish)|! !| baby greens|! !| blue cheese|! !| and walnuts. The recipe can be easily doubled if you need to serve more. For many years our family’s Thanksgiving dinner has been somewhat of a move-able feast. The reason being is that the men in our family were such avid sportsmen that duck-hunting season ruled the day and time that we sat down to give thanks. Many times we gathered on the Wednesday night before Turkey Day since Papa and my brothers headed out in the wee hours the next morning to get to the blinds before the sun came up. The feast sometimes was baked turkey with all the trimmings, but it was also at times a simple, but delicious, gumbo of chicken, sausage and oysters followed by pecan pie. Then there were occasions that, if the ducks were flying, Papa and the boys didn’t return until Friday or Saturday when another feast, if they had a good hunt, was celebrated with another repast, this one of baked duck, preceded by a course of freshly shucked oysters that they picked up in Abbeville on their way home from Pecan Island. One year when the men were absent from the table on Thanksgiving Day, Mama emptied the freezer and we girls dined on baked redfish stuffed with a goodly amount of crabmeat and shrimp accompanied by one of our favorites, potatoes au gratin, and finished off the meal with a rich lemon icebox pie made with condensed milk. Divine! Not being a great lover of turkey, I was rarely disappointed that the old bird did not grace our holiday table. In fact, as we grew older Mama made it a point not to have Tom Turkey for Turkey Day. For three years running, she baked Cornish hens covered in a citrus glaze. Then there was a period that she forsook all choice of birds, which my aunts said was almost blasphemous, and prepared things like grilled steaks, hamburgers, and yes, even shrimp poorboys! None of us felt cheated or like the poor cousins because we didn’t gorge ourselves on rice dressing, baked sweet potatoes swathed in syrup and topped with marshmallows, and pies of pumpkin or mincemeat. There was always the inevitable Christmas feast to look forward to when we would have more than enough to fill our tummies—roast pork, baked ham, a turkey, roasted ducks, oyster patties, several vegetable dishes and of course, desserts of all kinds, pralines and fudge. Come on, try something different. I promise nothing bad will happen except you won’t have that turkey carcass with which to make a gumbo the following day. Here are some ideas. Of course, it may not be for everyone. Certainly, I encourage families to gather together for a day of thanks, but if you can’t make it home this year, you might want to invite some friends who are in the same situation to share a meal together. Or, if you’re parents who are experiencing the empty-nest syndrome and the children aren’t coming home for dinner, take the opportunity to enjoy some time with your spouse and a few close friends rather than spending hours, even days, preparing a five-course for a cast of thousands. For starters, why not boil a couple of pounds of shrimp, peel them, then serve them with Uncle Nick’s curry dip. Toss the pears with two teaspoons of the lemon juice and set aside. In a small clean jar, combine the remaining two tablespoons lemon juice, the oil, the mustard, and the shallots. Fit the jar with a lid and shake to blend. Season with salt and pepper. Shake again and set aside. 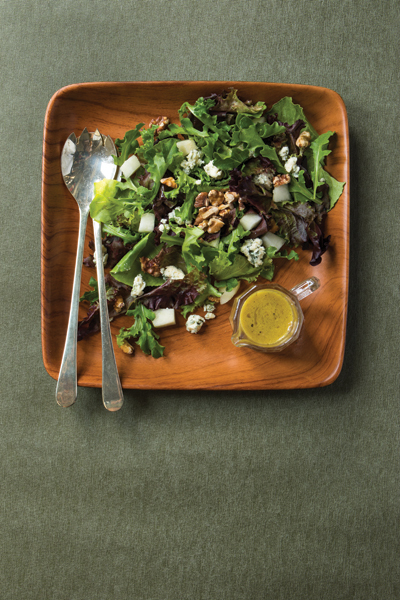 When ready to serve, put the salad greens in a large bowl, add the pears, the cheese and the walnuts. Pour in the dressing and toss to coat evenly. Serve immediately. Whisk all ingredients together in a small bowl. Chill for at least one hour before serving. Cut tenderloin lengthwise to within ½ inch of one long edge, leaving edge intact. Open the tenderloin out flat. Place a large piece of heavy-duty plastic wrap over tenderloin and pound to flatten slightly. Remove wrap. Spread mustard evenly over the meat. Sprinkle evenly with half of the black and white peppercorns. Fold one side of the tenderloin back over and tie securely with kitchen twine at three-inch intervals. Rub with oil and remaining peppercorns. Place tenderloin on a rack in a roasting pan. Insert a meat thermometer in the thickest part. Roast for 30 to 40 minutes or until the thermometer registers 135 to 140 degrees for medium-rare; 45 to 50 minutes or until the thermometer registers 145 to 150 degrees for medium. Remove from oven and let stand for about 10 minutes before slicing to serve. Sprinkle with salt to taste. Carefully use a thin, flexible knife to cut and remove the skin off the beef tenderloin, which is a thick layer of white or silverish connective tissue along the surface. This tough tissue never tenderizes and doesn’t taste good if left on the meat. Preheat the oven to 325 degrees. Tie pork loin at two-inch intervals with kitchen twine to hold its shape. In a small bowl, combine flour, cayenne, salt and pepper and rosemary. Rub this mixture evenly all over the loin. Heat two tablespoons of butter in a large heavy skillet and sear the meat over high heat, turning often until evenly browned. Transfer the loin, with pan juices to a large baking pan. Scatter onions and garlic around the roast. Cut up the remaining butter and distribute evenly over vegetables. Cover with foil and place in the oven. Cook for 45 minutes, then add apples and cider to the pan. Baste everything with pan juices. Cover and cook for 30 minutes more. Raise the oven temperature to 400 degrees and remove foil. Baste and cook for another 15 minutes. Remove from oven and transfer the loin to a cutting board. Carefully remove twine and let stand for 10 minutes. Meanwhile, transfer onions and apples to a platter. On top of the stove, reduce the pan juices by half. Warm the Calvados and carefully pour into the pan. It should flame, then die down. Keep a pan lid nearby in case the Calvados flares up. Simmer sauce while you slice the pork loin. Arrange the meat over apples and onions and serve with sauce. Combine ½ cup of cheese, salt, garlic powder, nutmeg, and pepper in a small bowl and set aside. Layer one-third of the potatoes in a lightly greased 12-by-8-by-2-inch baking dish. Sprinkle half of the seasoning mixture over potatoes. Repeat layers with potatoes and seasoning mix, ending with potatoes. Sprinkle evenly with the remaining two tablespoons cheese. Combine cream and water and pour over potatoes. Cover with foil and bake for about one hour, or until the potatoes are tender. Uncover and bake for 10 to 15 minutes or until the top is lightly browned. Remove and cool a few minutes before serving. Put water in a large saucepan over medium-high heat and add salt. Bring to a boil, add beans, reduce the heat to medium. Cook for about eight minutes, or just until beans are slightly tender. Drain, then plunge into ice water to stop cooking. Drain again. Heat oil in a large skillet, add garlic and beans and toss to coat. Cook for one to two minute just to heat through. Add dill and season with salt and pepper. Toss again and serve.